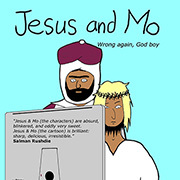 Jesus and Mo will be back in June. We’ve been waiting for Jesus for 2000 years. No false promises, please, I can’t take them any more!! We’ll all miss the strip, I’m sure. Have a great escape and thanks for the laugh. nice send off before your vacation! Enjoy the vacation, Author. Hope you have a great time and return safe and sound. Now I guess I’ll actually have to do some work instead of reading Jesus and Mo. Here’s to the next 250. I’ll miss you guys! Look forward to you getting back but have a nice break. Have a good break, guys. We’ll all look forward to the pics from the beach. “Jesus and Mo will be back in June” — Ack! I can’t wait that long! That’s like, at least a week away! Maybe more! and thanks for the laughs! Always great, but today you break records on intelligent humour! Congratulations! Jesus H. Christ, do you know how far away that month is? Bye y’all. Thanks for all the fish. No more laughs till June? Noooooooooooooooooooooooooooooooo! Since you ask, Jerry w, the H stands for Harold. Y’know, Harold be thy name. Our Arthur, who art in Devon, Harold be thy name. Thine missus thinks it’s Heaven.